I follow a good number of bakeries and bakers from all over the world on social media, especially on Instagram. 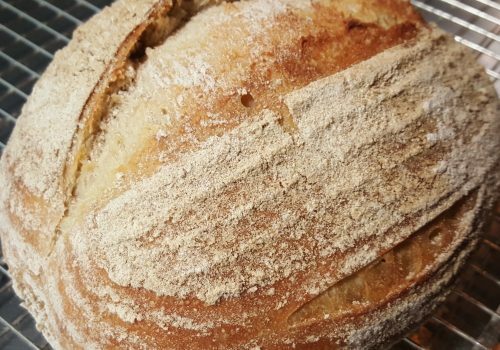 You can pick up some fantastic tips and you can be inspired by all the wonderful bread that is being made from California to Tokyo and nearly everywhere in between. It never fails to cheer me up, seeing gorgeous loaf after gorgeous loaf, sourdough and yeasted breads. One thing I noticed, especially from American bakers, was that they were talking about switching over to their summer recipes. Hang on, I thought. Say again. Yep, apparently, it’s a thing where the climate is warmer to change bread recipes when the weather gets hot. Wow, that’s very interesting I thought to myself. Imagine having to change everything you do because the sun’s come out. Good job I live and work in Cumbria. We’ll never have that problem around here. All of a sudden, our sourdough breads started to act weirdly. We came to them in the morning to form them and the dough was wet and lifeless. We carried on, popped them into their proving baskets yet when we tried to bake them, the loaves hardly rose at all. What was wrong? Why the sudden change? It was the heat. We were treating the sourdoughs in exactly the same way as we treated them in the depths of winter yet the temperature in the bakery was much higher. What was happening was that the yeasts within the sourdough cultures were getting overexcited. They dough was proving far too quickly so that when we came to use it the following day, all the energy was gone from it. We tried a few things. We added less starter. We reduced the additional water we mixed in. Neither of these made much of a difference. So we resorted to mixing the dough much later in the day – at roughly midday rather than six in the morning. That seemed to crack it. By giving the dough less time to prove, we caught it before all its energy was used up. The loaves started to rise again properly and we were all quite relieved. Another huge learning experience for us. We’ll probably not experience temperatures like that again for a good few years but at least we’ll know what to do if it happens again. You never stop finding out new things in this business. Looking forward to what winter can chuck at us next. We’ll be ready.